When it was founded in 1942, STS competition awarded a prize to the “Top Boy” and “Top Girl.” Then inexplicably in 1948, the competition dropped these designated awards, and winners during the second half of the 20th century tended to be predominantly male. In the 21st century, this trend has shifted to more females in the STS winner’s circle as the number of female competitors increased. Women make up the vast pool of our nation’s untapped STEM talent, and they are being encouraged to enter professions that once were deemed male-oriented STEM careers. Notwithstanding this good news, male students are still three times more likely than female students to be interested in pursuing a college major or career in STEM. It is well known that young women gain or lose interest in STEM subjects by the 8th grade and that encouraging and mentoring young women where they naturally congregate is critical to influencing the elective education choices that they make in high school. Just go to any middle school and you will see girls moving in ‘pods.’ Girls like to talk, to share, to engage each other in common interests and to enjoy social processes that, while natural for them, have not been formally incorporated into STEM pedagogy. 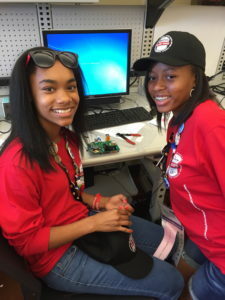 To address this, Broadcom Foundation partners with other community and nonprofit stakeholders to bring the excitement of science and engineering to the programs that reach girls in their everyday lives: in afterschool programs like Girls, Inc., out of school group activities such as Girl Scouts and competitions such as the Broadcom MASTERS. In these programs, the key to building an interest in STEM is through a girl’s inclination to socialize with other girls and collaborate in teams. makes sense to tap into young women’s natural inclination to work together and collaborate in teams in order to inspire long-term interest and excitement in STEM subjects. In doing so, STEM-minded girls will be inspired and encouraged to apply their natural gifts to stay excited about science, technology, engineering and math into high school, college – and beyond. Broadcom Foundation supports programs that inspire, educate and deploy the next generation of scientists, engineers and innovators who will take on the Grand Challenges of the 21st century. By creating equitable access to STEM education, all young people can explore, excel and ultimately chose career paths in STEM subjects and become next generation of innovators have the critical 21st century skills that they need to succeed in a global work environment. Broadcom Foundation focuses its advocacy of STEM education on “Project-Based Learning,” and teamwork, which provides the philosophical underpinnings of its signature programs: Broadcom MASTERS® and Broadcom Presents: Design_CODE_Build.